What a ride. 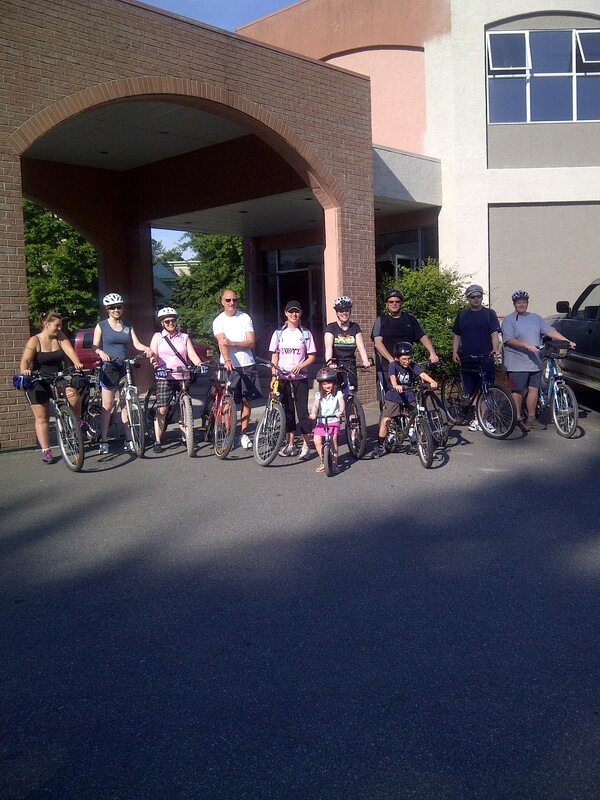 10 of us set out to ride 25 kilometers and to raise funds for people on the downtown eastside of Vancouver. This is the poorest neighbourhood in all of Canada. I had spent considerable time there in 1998 with some dear friends building relationships with people there and helping meet their physical needs. My 8 year old son decided to ride with us. I don’t think he had any idea what riding 25kms really meant or looked like, but really neither did I.
I do and have always loved to bike ride, even from when I was a kid in my small town and my bike meant the freedom to go anywhere my legs would peddle me. I am sure there were days I easily rode 25 kms but that was a long time ago. I was very nervous starting out because it was a trail I had never been on before – just as many journeys of my life are like. This was different though because my son was along for the ride. My brain went through all the worst case scenarios possible but I refused to let me fear hold us back. It wasn’t always easy but it was definitely a wonderful adventure. I kept thinking about how symbolic our ride was of raising my children. There were times when I lead from the front and he followed behind, but most often I lead from beside or behind. I encouraged him all the way, though sometimes he needed more encouragement than others. There were times I had to stretch the truth and tell him that we were almost at the next check point even though in reality I had no idea how much further it was. I just knew that it was what he needed to hear to make it there. I didn’t lie to my son, I just knew he needed me to be confident even if I really wasn’t. There were times he rode with others in our group and they encouraged him as well. I kept telling him how proud of him I was. After we passed half way and it was evident he was going to make it all the way, I was even more proud. I thought he would only get half way, but even after we arrived back at our church and had lunch, the kid got back on his bike and rode around the parking lot. There were times we raced each other and times we just wanted to beat the people in front of us. I think I only had 5 moments where my heart skipped a beat. It was fabulous to share this experience with him. It made me think of all the times I need to hear from my Father, keep going, your almost there.